DCI Products prides itself in innovative, quality products and as part of our committment to excellence was to make sure that our SmartVent attic ventilation was tested by a variety of independent agencies. One of the most important evaluations and approvals for our SmartVent was done by the International Code Council (ICC). SmartVent has been field tested, New England Ice Damming & Dade County Hurricane tested since 1999. SmartVent is the only patented over eave intake roof ventilation to achieve this benchmark. DCI Products wanted to take another step beyond the bar and apply for ICC evaluation knowing that architects and engineers reference the ICC for keeping their projects in accordance with globally accepted policies and standards. 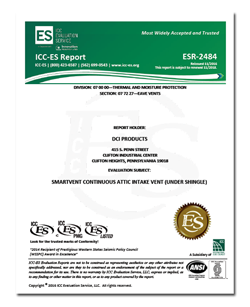 After evaluation by the council, DCI Products SmartVent was included in the ICC’s reports. You may click on the image to the left to download the full report.The report is in PDF format and requires a PDF reader. If you have questions about SmartVent and its various applications we invite you visit the main SmartVent application pages found on this site. SmartVent attic ventilation can be used almost anywhere on the roof deck as long the roof pitch is 4/12 or greater. To learn more about roof styles and roof pitches you can follow this link (click here). order to work properly. SmartVent, when used at both soffits, has a total NFA rating of 18 sq. in. per foot (or 9 sq. in. per foot on each side of a standard gable roof). attic ventilation available. Using a unique design and installation method, SmartVent eliminates the problems and inefficiencies found in roof construction using ridge and soffit venting, namely inadequate vent openings in the soffit.